Da Capo Press, 9780306902079, 304pp. Following a series of top-ten hits that became instant American standards, the Weavers dissolved at the height of their fame. 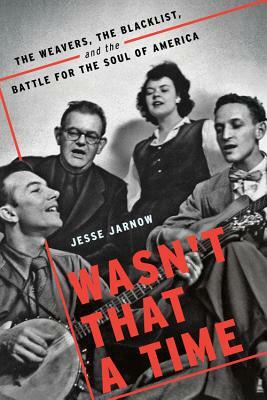 Wasn't That a Time: The Weavers, the Blacklist, and the Battle for the Soul of America details the remarkable rise of Pete Seeger's unlikely band of folk heroes, from basement hootenannies to the top of the charts, and the harassment campaign that brought them down. Exploring how a pop group's harmonies might be heard as a threat worthy of decades of investigation by the FBI, Wasn't That a Time turns the black-and-white 1950s into vivid color, using the Weavers to illuminate a dark and complex period of American history. With origins in the radical folk collective the Almanac Singers and the ambitious People's Songs, the singing activists in the Weavers set out to change the world with songs as their weapons, pioneering the use of music as a transformative political organizing tool. "Extensively researched, Jarnow's deep and accomplished portrait of these iconic musicians reverberates with a mastery that will appeal to both fans and everyone interested in the history of music." "Explores...the creative, idiosyncratic, difficult personalities who briefly bottled lightning and subsequently transformed American music from Bob Dylan's output to schoolhouse sing-alongs...For fans of the Weavers and those they influenced, as well as lovers of 20th-century American folk music."